Visit Giant Family Choice Award 2018 online link. Fill up your personal details. Vote for your favourite brands! Winners are decided by those who have the closest match with the most popular survey results. 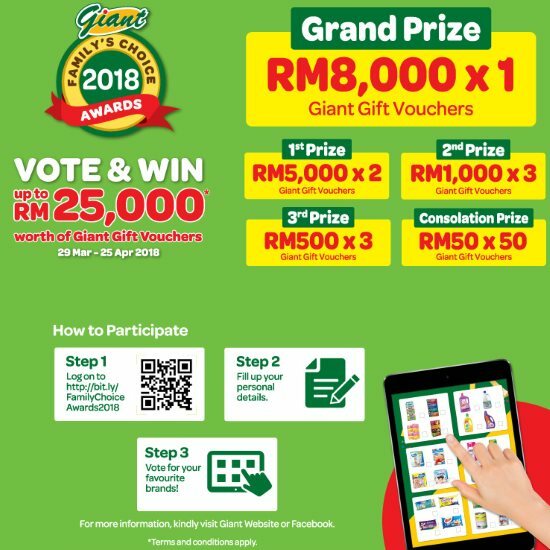 Visit Giant Family's Choice Award 2018 Vote & Win Contest terms & conditions for more details. Want to know last year's winner list? Check out Giant Family's Choice Award 2017 winner list here. Shopping online? Save with the best promo codes in Malaysia!